Rockford’s hometown merchant is taking a new step in serving its customers, as it opens a second location. See how its new store on Rockford’s east side promises to make this family company a powerful force in furniture. Earlier this year, the Annual Retailer of the Year Award was received by Furniture First, Gustafson Furniture & Mattress’ buying cooperative. The award was presented by the International Home Furniture Association in Highpoint, N.C. This is the first time a buying cooperative was selected as a recipient of the award, thanks to a massive volume of purchases. L-R: Bill Hartman, president of Furniture First Buying Cooperative with Gustafson’s staff members David Gustafson, vice president of advertising; Krista Patrick, assistant furniture buyer; Trina Gustafson, CFO; Christopher Gustafson, vice president of operations; Dale Gustafson, CEO; and Mitchell Johnson, store manager and mattress buyer. Dale Gustafson’s father, Martin, taught him many things about the retail business. But the most important lesson he passed down to his son was the No. 1 rule in customer service. Martin was right on the money. This year, Gustafson’s Furniture, 808 W. Riverside Blvd., Rockford, is celebrating 87 years in business. It hasn’t always been easy, Dale says, but he wouldn’t have done it any other way. “It’s been a labor of love,” he says. Good things continue to happen for this longtime Rockford merchant. This fall, Gustafson’s Furniture is set to open a second store in Rockford. The business recently purchased the former American TV & Appliance location, at 6651 E. State St. The new location is 97,000 square feet on one level. The new store will offer a wide selection of merchandise and provide the business with a 10,000 square-foot warehouse. The Gustafson’s staff has spent the past several weeks getting ready to open the new location. Gustafson’s East, as Dale calls it, has received a major facelift: repaved parking lot, new sidewalks, carpeting and fresh paint. Dale says the second location will be a welcome addition for all customers and will house the largest mattress display in the Midwest. The store will present 154 vignettes, or living room displays. Martin Gustafson grew up on a farm in Stillman Valley, Ill. His father died from pneumonia, leaving his mother to bring up 11 children. With an eighth-grade education, Martin sold mothballs and vacuums door-to-door. He was successful because of his strong rapport with customers. “He had a big heart and a love for people,” says Dale. Dale went to work for his father when he was 12 years old. He headed to the shop after school, dusting appliances and dishes for the bridal registry. After serving a short stint in the U.S. Navy, Dale came home to join the family business and has been there ever since; he took over the company when he was 26. Martin suffered health problems for several years, before passing away in 1985. In 1998, after 63 years on Seventh Street, Gustafson’s relocated to its current location at 808 W. Riverside Blvd. Located in the former 109,000 square-foot Bergner’s store at North Towne Mall, Gustafson’s has 14,000 pieces of furniture in its showroom, including 3,000 mattresses, making it one of the largest stores of its kind in the state. At Gustafson’s, the customer is in charge of any buying decision. “It doesn’t matter if they spend $199 or $1,000 with us, every customer is important,” says Dale. “When you take care of your customers, they come back.” Dale estimates that, over a lifetime, a customer will spend an average of $50,000 on furniture. This past April, Gustafson’s Furniture & Mattress had another reason to celebrate. 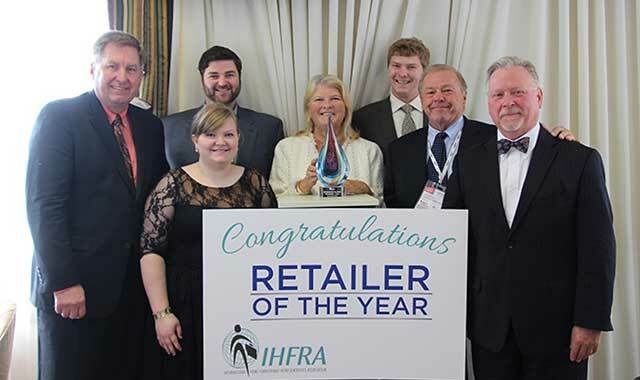 Its buying group, Furniture First, received the annual Retailer of the Year Award. The award was presented by the International Home Furniture Association in High Point, N.C. This was the first time a buying cooperative has received the award. Dale can’t imagine doing it anywhere but in Rockford, which is evident by the recent news of Gustafson’s second location. This entry was posted on Friday, October 30th, 2015 at 11:56 am	and is filed under Northwest Business Magazine. You can follow any responses to this entry through the RSS 2.0 feed. Both comments and pings are currently closed.